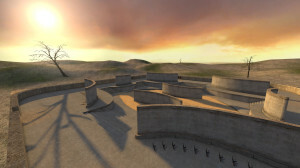 Aim Map Pack 1 consists of four aim maps that were developed simultaneously and built with the intention of elevating the mapping standard typically found in aim maps. 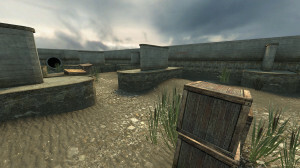 HDR, however, was intentionally omitted to keep the file sizes low because aim maps are often downloaded from the server when connecting. 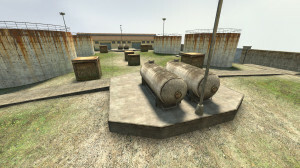 Lost Playground is an aim map where Terrorists get AK-47s and Counter-Terrorists get M4A1s. Both teams receive knives and body armour but no helmet is provided so that Terrorists don’t have an advantage over Counter-Terrorists. The curved surfaces, smooth concrete and sandy areas give the environment an atmosphere that feels vaguely like a beach-side skate park. In Desert Eagle Ultra Carnage, both teams receive a Desert Eagle, a knife and full body armour. 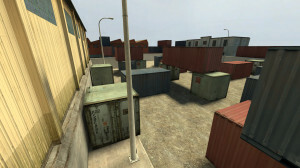 The arena is set among storage containers behind a warehouse that’s reminiscent of cs_assault. Unlike some USP aim maps where Terrorists start with no spare ammo, USP Canal provides both teams with full ammo. In addition to the USP pistol, both teams also receive a knife and body armour. No helmet is provided in order to encourage aiming for the head. Given the sniper oriented game-play of de_port, its art-style seemed like an appropriate theme to use in my AWP aim map. In AWP Port, you are armed with an AWP, a Desert Eagle and full body armour, although it is doubtful whether the armour will help with all these high-powered weapons around.